Before becoming a part of the sewing machine giant, SVP, Husqvarna/Viking was a giant in the sewing machine industry on its own merit.One hundred forty years ago, Swedish owned Husqvarna Munitions Company switched its focus and produced the first sewing machine under the Viking brand name. Since then, Husqvarna/Viking sewing machines have been staples in sewing rooms the world over. Husqvarna/Viking’s exclusive Sewing Advisor™, coupled with the innovative Infodisplay™ and Programdisplay™ features bring professional quality sewing directly to the fingertips of the home sewer. Enter fabric type, weight, and sewing technique and the Exclusive SEWING ADVISOR® feature will take care of all the settings – stitch, stitch width, stitch length, thread tension, sewing speed and presser foot pressure. These features are designed specifically with the discriminating home sewer in mind, assuring that they get the professional results they demand with he least amount of effort on their part. Husqvarna/Viking sewing machines are divided into two attractively named categories – flowers and jewels. Sewing Advisor™, Infodisplay™ and Programdisplay™ were introduced with the extremely popular Orchidea in the 1990s. Since then, the Husqvarna/Viking flowers, including the Rose, which we reviewed a little while back, have gained a place of respect in many sewing rooms. 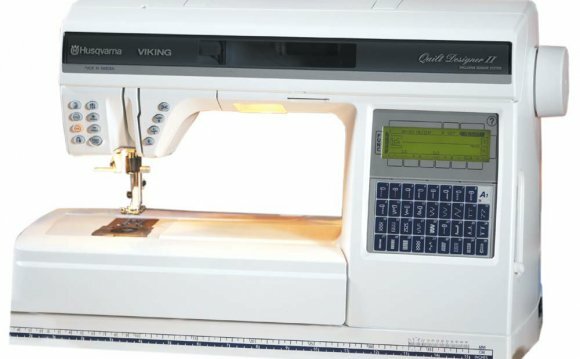 The Husqvarna/ Viking jewels, including the Diamond deLuxe, Ruby, Emerald, Topaz and Sapphire, have earned places of honor as the next generation of excellent Husqvarna/Viking sewing, embroidery and quilting machines for home use. Husqvarna/Viking sergers, and coverlock machines for home use are offered through the Huskylock line.